Sean Kendall says $10,000 offered as compensation is generous, but he wants the police to change policy. Courtesy Justice for Geist Facebook page Geist Leah Hogsten | The Salt Lake Tribune Marchers carried a portrait of Geist. 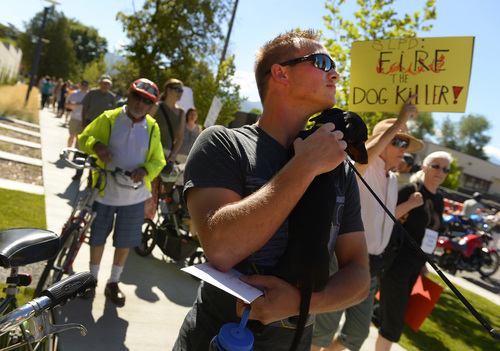 Hundreds of supporters of Sean Kendall and his dog, Geist, who was shot and killed in his backyard by a Salt Lake City police officer during a search for a missing child, rally to protest the officer's action, Saturday, June 28, 2014 at the SLC Police headquarters. Leah Hogsten | The Salt Lake Tribune Sean Kendall pets the dachshund of a fellow supporter as the sign holding marchers pass by during a protest on Saturday. 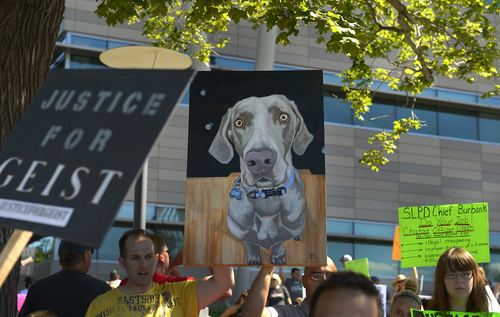 Hundreds of supporters of Kendall and his dog, Geist, who was shot and killed in his backyard by a Salt Lake City police officer during a search for a missing child, rallied at the Salt Lake City Police headquarters to protest the officer's action. 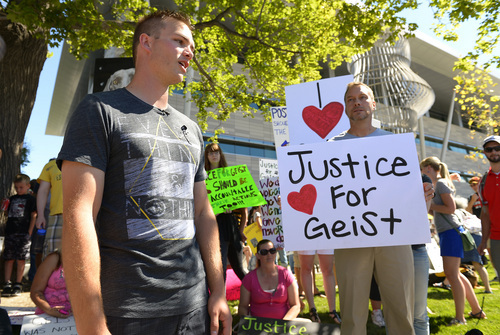 Courtesy Justice for Geist Facebook page Geist Leah Hogsten | The Salt Lake Tribune Hundreds of supporters of Sean Kendall (left) and his dog, Geist, who was shot and killed in his backyard by a Salt Lake City police officer during a search for a missing child, rally to protest the officer's action, Saturday, June 28, 2014 at the SLC Police headquarters. 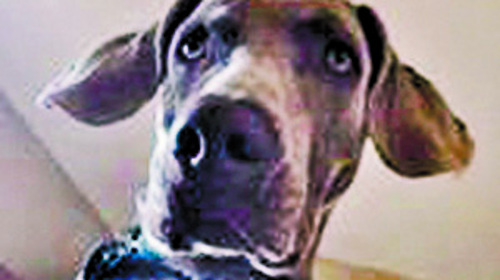 The owner of a dog killed by a Salt Lake City police officer last month said he has turned down the department&apos;s offer to pay him $10,000 to compensate him for his pet. Sean Kendall, owner of the dog, Geist, that was shot dead by a police officer in its own backyard last month, acknowledged the generosity of the department&apos;s offer, but said he would not be satisfied until the department agreed to change its policy governing using force against dogs. "Even though it really is pretty enticing to take the money and run, I don&apos;t think that&apos;s what&apos;s best," Kendall said Tuesday afternoon, less than an hour before the department&apos;s offer was set to expire at 5 p.m. In a statement released Tuesday afternoon, Salt Lake City Police Chief Chris Burbank said the department was "disappointed" that Kendall turned down the money, which Burbank said Kendall had requested. Salt Lake City police Officer Brett Olsen shot Geist on June 18 during a search for a missing 3-year-old boy, who was later found asleep in his own basement. The police department has received hundreds of emails asking for Olsen&apos;s termination, and rallies have been held outside police headquarters and in front of the Utah Capitol. Olsen has remained on duty while the department conducts an investigation, which will soon be completed and released to the public, SLCPD Sgt. Robin Heiden said last week. An independent investigation into the incident by the Salt Lake City Police Civilian Review Board was completed July 18. 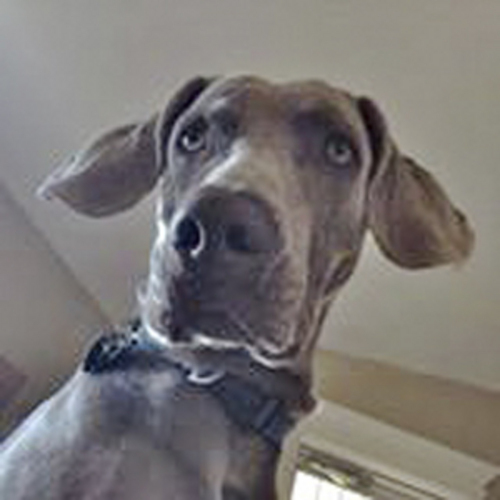 The inquiry sought to answer whether Olsen was legally on the property when he shot Geist and whether he reasonably believed that the dog would kill or seriously injure him. The results of the independent investigation will be kept secret until the police department completes its internal review and decides whether to take disciplinary action against Olsen, said senior city attorney Boyd A. Ferguson in response to an open-records request. Kendall worried that by accepting the department&apos;s compensatory offer, he would effectively give up his seat at the bargaining table if the department decided to take no action once the results of the investigations are released. By rejecting the offer, Kendall believes he has a better chance to force the department to change its policies. "It&apos;s not about the money," Kendall said. "There&apos;s been a lack of action from Chief Burbank. Brett Olsen is still on the force, there&apos;s been no consequences, no disciplinary action, no anything. It isn&apos;t appropriate. It isn&apos;t right." Kendall said he wants the department to adopt a use of force policy akin to the one it has for humans. In some cases, Kendall said, lethal force against dogs is appropriate, but it should be used only as a last resort. "If police encounter us, they have to meet our resistance with the same level of resistance," Kendall said. "They can&apos;t just pull out their gun and shoot us for no reason." In his statement acknowledging the end of the settlement negotiations, Burbank said the department had negotiated in good faith and criticized Kendall&apos;s decision to turn to Facebook and the media to publicize his positions. "Due to Mr. Kendall&apos;s premature Facebook posts and desire to negotiate through the press, the police department has ended our attempts to meet his financial demands," Burbank wrote. "To clarify, this was his request for a settlement, not our offer. We continue to press ahead with our internal process and expect to conclude our investigation this week." Kendall had posted two messages to the "Justice For Geist" Facebook page since late Monday night. In the first message, which by Tuesday afternoon had garnered nearly 8,000 "Likes," Kendall announced that the department had made a settlement offer and said he&apos;d prefer a public apology and a policy change to financial compensation. In the second message, posted Tuesday afternoon, Kendall said he had accepted the department&apos;s offer, but he quickly changed his mind and deleted the message. Kendall agreed with Burbank that the posts were premature and added that he regretted posting them. "I didn&apos;t quite organize my thoughts adequately. This is an extremely emotional time. I haven&apos;t slept well. I haven&apos;t been able to think very clearly," Kendall said. Kendall said that when his demands are met, he will consider getting another dog. "Right now," he added, "I feel like I need to spend time preventing this from happening again."